Summary: A new study supports olfactory testing as an early method to detect those at risk of developing dementia. Large, diverse study suggests olfactory testing may be a simple way to predict dementia a decade before symptoms occur. Researchers said the results support olfactory testing—which is simple, non-invasive and inexpensive—to identify those at risk for developing dementia. Previous studies have not included diverse populations, so it was not clear whether the testing might be useful. The study, which was published in Neurology, analyzed the medical records of 2,428 community-dwelling adults enrolled in the prospective Health, Aging, and Body Composition study conducted by the National Institutes of Health. The participants were between 70 and 79 years old when they enrolled in the study, and none had developed dementia. Study participants took the Cross Cultural Smell Identification Test, in which they were asked to identify a series of a dozen smells. Those who performed poorly on the test were two to three times more likely to have developed dementia nine years later than those with good olfactory performance. Moderate performers were 1.4 to 1.8 times more likely to have developed dementia than good performers. The link between poor olfaction and risk of neurodegenerative disease has been known for some time. NeuroscienceNews.com image is for illustrative purposes only. 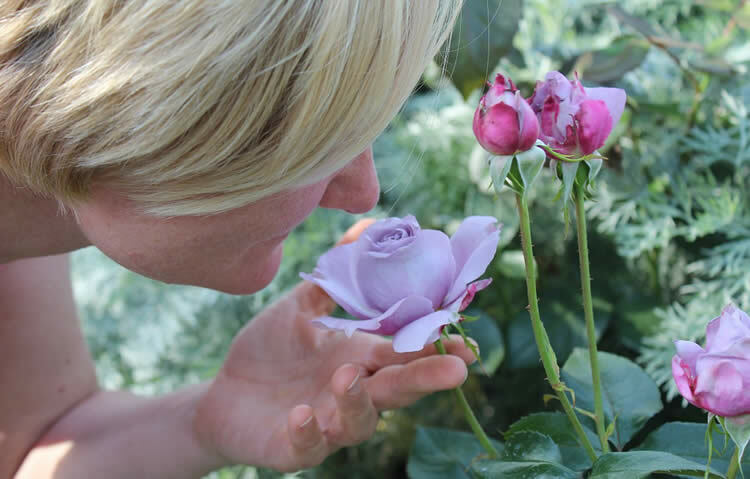 The link between poor olfaction and risk of neurodegenerative disease has been known for some time, Yaffe explained, but the current study is the first to look at that association in both black and white older adults over such a long follow up of nearly 12 years. “This work validates the use of odor identification as a simple, inexpensive and highly sensitive marker of risk for preclinical dementia among older adults,” she said. Co-authors of the study are Daniel Freimer, BA, of the Northern California Institute for Research and Education; Honglei Chen, MD, PhD, of the National Institute of Environmental Health Sciences; Keiko Asao, MD, MPH, PhD, of the University of Tennessee; Andrea Rosso, MPH, PhD, of the University of Pittsburgh; Susan Rubin, MPH, of UCSF; Greg Tranah, PhD, and Steve Cummings, MD, of the California Pacific Medical Center Research Institute; and Eleanor Simonsick, PhD, of the National Institute on Aging. Funding: The study was supported by funds from the National Institute on Aging, the National Institute of Nursing Research and the National Institute of Environmental Health Sciences. UCSF “Poor Odor Identification May Be An Early Warning For Dementia.” NeuroscienceNews. NeuroscienceNews, 3 February 2017. UCSF “Poor Odor Identification May Be An Early Warning For Dementia.” http://neurosciencenews.com/dementia-odor-detection-6054/ (accessed February 3, 2017). Objective: Prior studies indicate that olfactory function may be an early marker for cognitive impairment, but the body of evidence has been largely restricted to white populations. Methods: We studied 2,428 community-dwelling black and white older adults (baseline age 70–79 years) without dementia enrolled in the Health, Aging, and Body Composition (Health ABC) study. Olfaction was measured as odor identification (OI) with the 12-item Cross Cultural Smell Identification Test in year 3. We defined incident dementia over 12 years on the basis of hospitalization records, prescription for dementia medication, or 1.5-SD decline in race-stratified global cognition score. We assessed dementia risk associated with OI score (by tertile) using Cox proportional hazards models. All analyses were stratified by race. Results: Poorer OI in older adults without dementia was associated with increased risk of dementia. After adjustment for demographics, medical comorbidities, and lifestyle characteristics, white participants in the poor or moderate OI tertile had greater risk of dementia (adjusted hazard ratio [HR] 3.34, 95% confidence interval [CI] 2.45–4.54; and HR 1.84, 95% CI 1.33–2.54, respectively) compared to those in the good tertile of function. Among blacks, worse OI was associated with an increased risk of dementia, but the magnitude of the effect was weaker (p for interaction = 0.04) for the poor OI tertile (adjusted HR 2.03, 95% CI 1.44–2.84) and for the moderate tertile (adjusted HR 1.42, 95% CI 0.97–2.10). There was no interaction between OI and APOE ε4 and risk of dementia. Conclusions: While the magnitude of the association was stronger in whites, we found that poor OI was associated with increased risk of dementia among both black and white older adults.